Casino Hold’em is Texas Hold’em’s baby – an only child, as it pits player against dealer, rather than players against other players. This game is perfect for those entering the world of Texas Hold’em poker, to get a feel for how the game operates and the variety of hands and options you have as a player. For more experienced players, Casino Hold’em also provides you with a deserved break from the intense strategy and tactics of Texas Hold’em, allowing you to focus solely on your own hand and what the dealer could potentially have. With some additional side betting options available, real money Casino Hold’em can be highly profitable and boasts great entertainment value. In Australia, land based casinos do offer variations of the game of Casino Hold’em, however most tables own, at the very least, a $10 minimum wager for the ‘ante’, and thus the entire hand can become quite expensive (when ‘call’ bets are factored in to play, as we explain below). Additionally, hand payouts tend to be lower for the player than they are online – online casinos have no where near as many overheads as brick and mortar casinos do (if any), and so such interactive platforms can offer superior odds and payouts for the player. Sign up for an account at any of our endorsed and licensed websites (details such as name, username, password, email address, country of residence, preferred currency required) and try before you buy – you can play Casino Hold’em within practice mode to become more acquainted with game until you heart is content, and then switch over to real money mode. Make a real cash deposit via one of the several globally trusted and secure deposit methods, and grab your new player welcome bonus. Casino Hold’em is played with a standard pack of 52 cards (no Jokers), and cards are ranked in the typical order, falling from Ace (high or low), King, Queen, Jack, 10, 9, 8, 7, 6, 5, 4, 3, 2. The player must place an ‘ante’ wager in order to be dealt his or her two cards. Once the ‘ante’ wager is placed, the player has the option to place a side bet known as the ‘AA Bonus’ bet. He or she can then click ‘deal’. AA Bonus side bet – This side wager is based on the player’s two cards and the ‘flop’, and is paid out if the hand boasts a pair of Aces or something of a higher ranking. The player must ‘call’ (play the entire round) to have any AA Bonus winnings paid out. 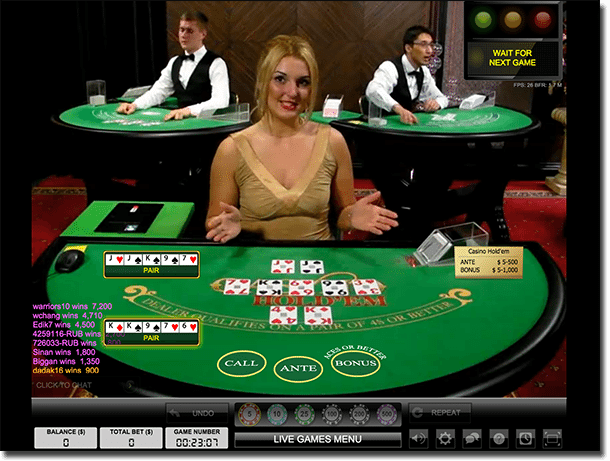 Once the player clicks ‘deal’, he or she receives two face up cards, while the dealer receives two cards face down. Three community cards are dealt into the middle of the table (the ‘flop’). The player can now choose to either ‘fold’ or ‘call’. In order to ‘call’, a bet double the amount of the ‘ante’ is typically required. If the player ‘folds’, he or she will lose all bets placed, including any possible AA Bonus winnings. If the player ‘calls’, he or she will be paid out any AA Bonus winnings, and the hand will continue. Two more cards will be dealt into the middle (the ‘turn’ and ‘river’ dealt simultaneously), and then the player’s hand and dealer’s hand will be compared. According to traditional poker hand rankings, if the player beats the dealer, he or she is paid out in accordance with the pay table, which is displayed within the game. The theoretical return to the player for Net Entertainment’s Casino Hold’em game (based on the pay tables above) is 98.75 per cent, and other titles remain around that mark, too (far better than any land based variant). Head to Guts Casino and enjoy a range of poker variations boasting betting limitations ranging from $0.50 to $100 (and more for VIPs).